Featured Artist Update: Joshua Flores! Joshua Flores is back with a new sound, a new look and a new EP! We are pleased to have had the chance to speak with Joshua about signing with IHM/Astro Music Group as well as his upcoming project! 14-year-old Joshua Flores first graced the pages of Livingtru.com back in February, 2011. Since then he has made tremendous progress as an artist, with a new look, a more mature sound and a new EP, not to mention recently signing a recording contract with IHM/Astro Music Group. I recently had the chance to speak with Joshua in depth about his new EP and the release of his latest music video "Never Should've Let You Go." Check out this Exclusive update interview with Joshua Flores. Joshua, its so great to speak with you again! It's been awhile since your first interview with LivingTru.com! Give us an update on your music career. Has anything exciting happened over the past year? I heard that you're working on a new EP? Since I last spoke to you I have been signed to IHM/Astro Music group after they discovered me on YouTube. Since then I have been in the studio recording songs for my upcoming EP, and I will be releasing my first Official Music video for my newest single “Never Should’ve Let You Go,” which is now available on iTunes, Amazon & CD Baby, and I am working on another new single “Kiss Me Baby” which will be on my EP. I recently performed in New York which was really exciting, and it was the first time I have ever performed in front of a crowd of screaming girl’s which was very exciting! That was a great experience! I’ll be traveling to Miami soon to continue recording the remainder of my upcoming EP. I also launched a new website, www.OfficialJoshuaFlores.com, which I really love. This has been a great year! That's awesome! I checked out your new video and it was amazing! You've grown so much as an artist! Did you get to take part in any of the writing on this new project? What inspired the songs? I didn't participate in the writing of my latest single, but with the new record label I have been blessed to have Grammy award winning writing teams; the Corner Boyz and ItzTheOffice Group helping me. It has been a lot of fun working with them and I am becoming a better writer as a result. I am looking forward to being a co-writer on my upcoming projects, and applying my new writing skills. I have a lot of things I am passionate about and I am looking forward to expressing those things to my fans on upcoming singles. Well I can't wait to hear those tracks and I'm sure your fans can't either. Speaking of which, You've become very popular, do you find it hard to focus on things like school, friends or even relationships when you're constantly traveling and recording? How do you keep yourself grounded? It has been a little challenging to balance school, friends and family with my new schedule and being signed with the label, but my mother works for the school system and both my parents are musicians, so they have been able to help me adjust and balance everything out. I also have a very supportive and understanding team which makes it much easier for me. Even though my schedule gets really busy I make time every day to communicate with my fans through facebook & twitter. I love my fans and couldn't do this without their support every day. That's great, I know that your fans are some of your biggest inspirations. Besides them and yourself, who do you credit for your success thus far, who or what has kept you motivated? I would have to first say that a strong faith in God has helped me, along with my parents who are very supportive of my dream. I also have a lot of supportive friends and fans. And now that I have a label behind me it isn't that difficult to remain motivated because I feel closer to my dreams. That's an awesome answer. God is number one in my life as well, I'd like to touch on that a little more. Exactly what role does God play on this journey you're on? God plays a big role. I have been in the church my entire life and my father is also a music director in the church. I have a very strong faith and values that I live by that have helped me come this far. I first started singing in church which is where my career really started, and my church has been very supportive. I feel that God has helped open a lot of doors for me to accomplish my dreams, so God definitely plays a big role for me as an artist. You're a very wise young man Joshua, I'm glad to hear that! So, being that teenage boys are dominating the music industry right now, I'm sure you've been compared to some of them. Most teenage boys are compared to Justin Bieber, has this happened to you? If so, how do you feel about that comparison? When I first started singing my haircut was very similar to Justin's, and I did a lot of Justin Bieber covers on YouTube. It doesn't bother me when people compare me to Justin. I kind of take it as a compliment. Now that I'm a little older I don’t really get that too much because I don’t really sound or look like him, I have my own style, but I definitely respect him as an artist. I can see that! Your sound has definitely matured a lot over the past year, and I see that a lot of people have taken notice. How does it feel to see how much your fan base has grown in such a short period of time? I haven’t really gotten used to so much attention from so many people, it’s exciting, but I am still the same person and I really appreciate all of the support from my fans. I really enjoy doing something I love that makes other people happy. Awesome. I'm not going to take up too much more of your time, but what would you say has been your biggest moment thus far? I would have to say my biggest moment up to now was being discovered on YouTube, and getting a record deal from it. I didn't expect it and I was so excited! Also performing in New York and realizing that people really loved my singing was a big moment for me. That kind of made the record deal more real for me, as well as, being on the set recording my first official music video. It’s been great! Congratulations on everything Joshua! You deserve it, and I can't wait to see what else God has in store for you. I just have one more question and we're all done. What advice would you give someone else wishing to pursue music, or any other career that they're passionate about? The best advice I can give is, if you have a dream work very hard to achieve it, believe in yourself and be confident. That is what has worked for me. And there you have it folks! Joshua it's been a pleasure! Thank you so much for speaking with me. Everyone be sure to connect with Joshua on all of his social networks, the links can be found below. And don't forget to check out his latest music video "Never Should've Let You Go." 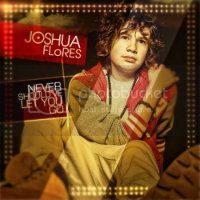 "Never Should've Let You Go" is the first official single and music video release from Joshua Flores' upcoming Ep!